This report is based above all on reports by refugees we met during various research trips in the period from December 2010 to December 2011 in Budapest, Debrecen, Bicske, Fót and Balassagyarmat. Some of them we had previously encountered: in Greece or Ukraine on their way to the European countries where they hoped for protection and a safe place to stay. Contacts exist to Hungary via the Border Monitoring Project Ukraine and in Greece the ‘Infomobile’ has regularly travelled since summer 2010 to locations important for those fleeing through Europe. From these contacts the trust has developed that is needed when such personal and often painful experiences are spoken of. Not so long ago, refugees actually managed to use the fingerprint left behind in Hungary in order to travel on “more safely”, because then they were “only” under threat of deportation to Hungary from where they set off again. It was not that difficult to escape again, even from the closed camp in Békéscsaba. Although they were under guard by security personnel and dogs, some succeeded in fleeing on. However many were later deported back to Hungary under the Dublin Regulation – some of them 2-3-4-5 times, stolen months, sometimes years in which no progress was made towards getting papers. Now, the loopholes in the Hungarian migration regime are (apparently due to European pressure) closed by the implementation of a tougher detention policy. Apparently due to pressure from the EU, Hungary has seen a massive tightening of the refugee detention system in 2010. In April 2010, in addition to the four existing detention facilities (Budapest Airport, Nyírbátor, Kiskunhalas, and Györ) and the “screening centre” in Békéscsaba (which is a closed camp), 11 new detention facilities were opened, and detention capacity increased from 282 to approximately 700 detention places. This increase in detention capacity happened rapidly. Often dilapidated cells in small police stations were recommissioned for this purpose. Detention conditions varied greatly. In some of these places the sheer state of the premises was horrible. Depending on the harshness of the detention regime massive protests broke out at all of these detention centres all summer. In smaller police station here and there people were treated more humanely. These facilities as a rule saw fewer protests, maybe only 1-2 hunger strikes during the summer months. Countless hunger strikes took place at most of the other (new and old) detention centres. There was a rise in incidents of self-harm (and unfortunately there were massive fights between different groups of detainees as well). In Kiskunhalas, near the Serbian border, one floor was completely gutted by a fire in the course of a revolt. All this remained almost unnoticed by the public. Nyírbátor and Kiskunhalas are regarded as “horror prisons” among the refugees. 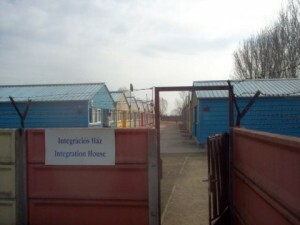 And while the additional 11 detention centres are temporarily closed again during winter, as the main arrival time was in the summer, at the same time the capacity of these prisons is being increased. The Nyírbátor detention facility was expanded from originally 169 to 278 places. Detention conditions were extremely bad: limited access to phones (only 5 minutes per day), one hour access to the yard per day, sometimes even this one hour is not given and there is no or almost no out-of-cell/association time. The buildings are now to be refurbished with EU money, gym and prayer room are to be built. With the summer having been the main season for protests and revolts in Hungarian deportation prisons (also because of the very crowded prisons), refugees report that since that time, sleeping pills and tranquillisers have been used with aim to sedate the detainees, in particular in Nyírbátor. As a result, all refugees transferred from this prison to Debrecen in the last 3-4 months were noticeably depressed and sleepy. Many try to continue to get “head tablets” from the camp doctor. The denial of these drugs made people aggressive, these are obviously strong drugs, which cause withdrawal symptoms when discontinued. “They started to use this method, because there was more and more trouble inside the prisons, the more people they put inside. Everybody has to take these tablets in Nyírbátor!” explains Reza (name altered) – and tells of his friend who wanted to refuse the tablets because he was not ill and as a result was severely beaten – until the tablet was swallowed. Refugees deported to Hungary under the Dublin II Regulation are detained as well. This practice may well be challengeable at the legal level, what is currently being planned is to bring individual cases before the Strasbourg Court of Human Rights. In practice it is common to say: “A person who has done a runner once and abandoned the asylum procedure is no longer an asylum seeker.” Refugees report that when they are arrested at Budapest airport they are told that they are placed in detention as a punishment, because they have run away from Hungary. Formally, a deportation order is issued directly upon arrival at the airport in Budapest, which allows for detention for up to six months (up to twelve months from 24/12/2010). Only those who are caught and deported very shortly after starting to travel on so that their file is still “open” and those who are already recognised refugees are not detained. The prisons are full of people deported from Austria, Germany, Belgium, France, etc. A very high percentage flees on after having been registered for the first time in Hungary, almost no one wants to stay in Hungary, and probably no one really intended to go there. Hungary is a classical transit country – from the east, from Ukraine, from the south, from Greece via Serbia to Central and Northern Europe. In fact, the recognition rates for individual groups (in particular, Somalis) tend to be good in comparison to other European countries. This is, however, contrasted by the more than difficult economic and social conditions. Recognised asylum seekers are only entitled to accommodation for 6 months, which can be extended by a further 6 months in special cases. After that they are likely to face homelessness. Jobs are very difficult to come by in Hungary. Refugees (and in particular, traumatised refugees) are unlikely to find the means to survive. Already last winter UNHCR published a report on homelessness among recognised refugees from Somalia in Budapest. The UNHCR report of November addressed this issue again. Furthermore family reunification is made de facto impossible (especially for Somalis) by the non-recognition of Somali passports or any substitute documents. This is another reason why many decide to move on and have another try. The new government quickly implemented an even stricter new asylum legislation directed mainly against “illegal migration”. Among other things, it includes an extension of the maximum length of detention pending deportation from up to 6 months as of now to 12 months. At first sight, this just looks like an adoption of European standards (as always towards “worst practice”) – once again, Germany serves as an “aid to orientation”. Nevertheless, with detention being applied, almost without exception, to all asylum seekers and Dublin returns continuing to be on the increase, it can be assumed that the detention centres will be full to capacity. However, the detention period for minors of up to 30 days which had initially been included was withdrawn from the bill at the very last minute. There are, at least, individual cases we know of where minors have been (illegally) detained after deportation as well (see: http://w2eu.net/2010/10/26/hungary-imprisons-minors-after-dublin2-deportation/). However, in many cases their dates of birth were altered prior to this (and sometimes only afterwards!). It has been reported several times that youth are subjected to medical age determination (x-rays and dental examinations) when they first arrive in Hungary, then most of them leave the country once they have been transferred to Bicske. After deportation from other European countries, on the basis of a visual check, the age is altered (occasionally by the same doctor!). That way, young people registered initially as 16 years old sometimes age by at least 2 years within a six-month period and are then 19 years old after visual examination. Refugees tell us that these are not isolated cases. Among them are young people, who have already been in 3-4 other European countries and, on the basis of all sorts of age determination methods, have been registered everywhere as minors. Unaccompanied minor refugees have so far been accommodated in Bicske where “Interchurch Aid Hungary” runs a camp for minors. In the future they are to be accommodated in normal children’s homes, presumably in the “Children Village” in Fot, from May at the latest. Refugees in Hungary don’t have all the rights that the government is supposed to give them, because when you are a new refugee and you arrive into a new country you need special care to integrate with that community: 1. to have a language course; 2. to have a shelter or a place to live within the community and not in isolated camps; 3. to be provided with professional skills if you lack them. I think if a person gets all these help I mentioned he or she can integrate with a community. If not, it is like some one being dropped in a dark place with no lights and he is asked to find a way out by him/herself. from that time until today I am in a camp, although they recognized me as a refugee and yet I did not get any protection and support from the state. They give us 7.000 HU, which is equal to 40 USD monthly and that is our only right. We do not have a chance to get an education and neither an accommodation. We do not have a chance to get a work because 12% of the Hungarian people do not have a work. We do not have the chance to telecommunicate with our people in our homes because of lack of financial means. We requested so many times from the government to reunite with our families here, but it did not happen – even they did not try. We have to worry about our families every day and night and that is an other additional stress.
. In the Bicske camp there is no freedom of religion, because they give us pig to eat, which is not allowed for Muslims. This never happens in Debrecen camp BUT it happens only in BESCKE camp. I felt frightened in Hungary and I thought as if I am in Somalia. When I first arrived in Hungary I believed that I am in a peace country but it was not as I thought because this made me dismoral and it destroyed my future because I don’t know why e became criminal and I have any lawyer and I don’t know how my future will be.